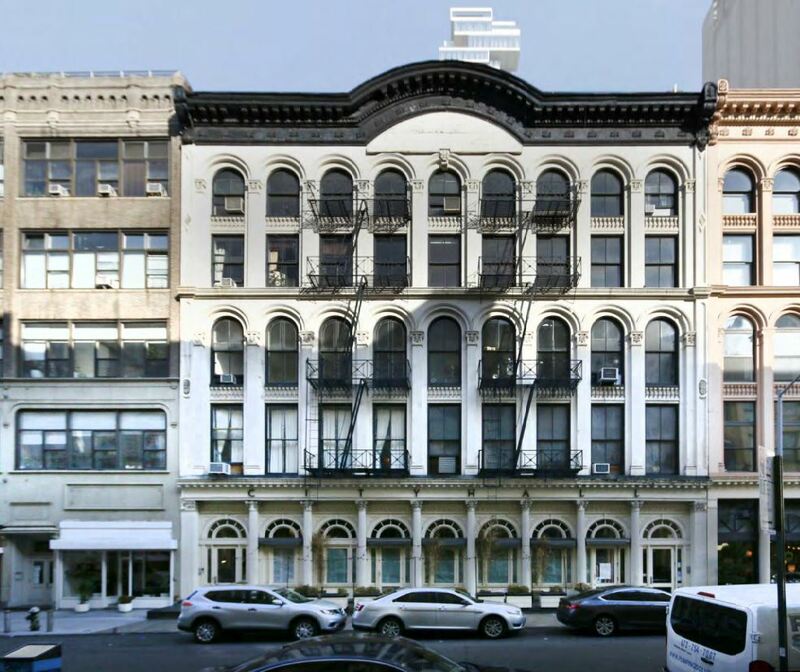 A proposal for a two-story addition atop 131-135 Duane Street is under review by the Landmarks Preservation Commission. 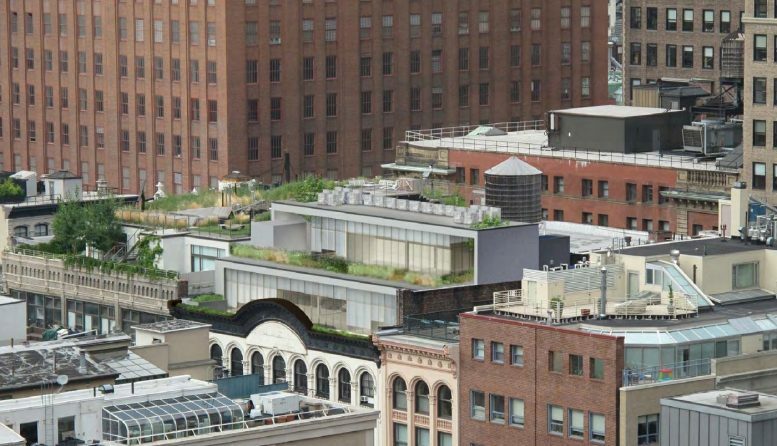 The site is located between Church Street and West Broadway in Tribeca, with the design being carried out by Jonathan Schloss Architect, a local Tribeca firm. 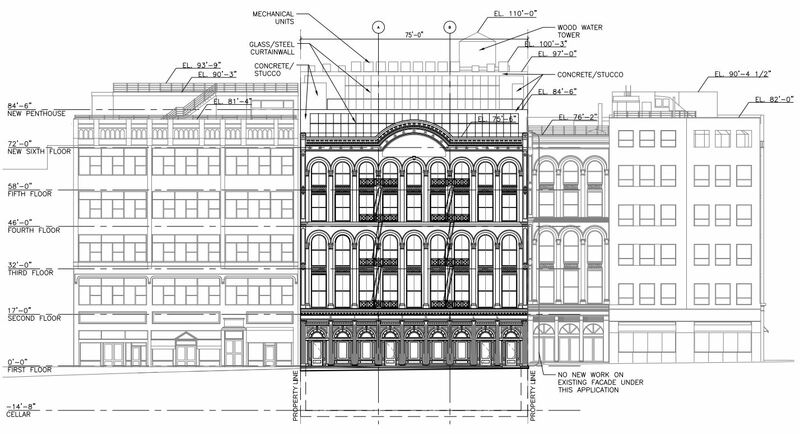 The existing white, square-shaped, five-story residential building comes with three rows of 10 arched windows on the ground floor, third floor and the fifth floor, capped with a dark cornice line and a central curved arch extending about six feet above the existing roof line. 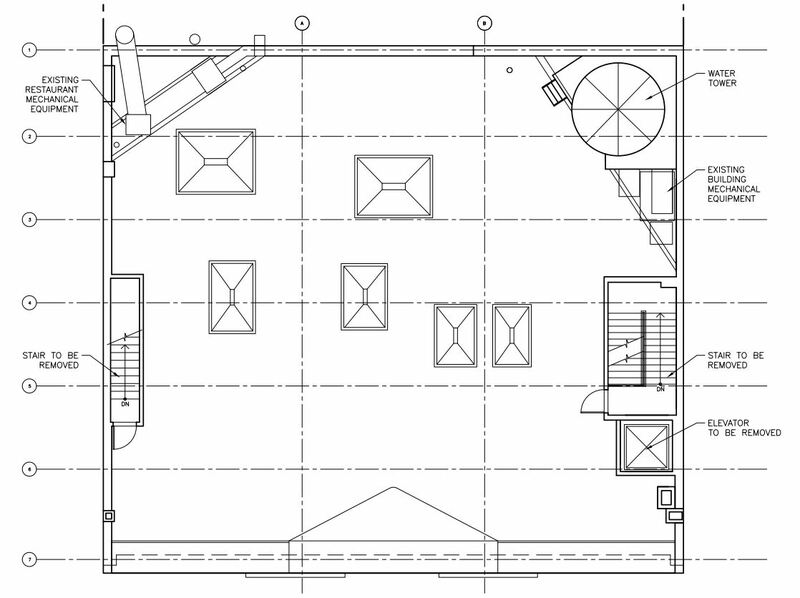 Before work on the new addition begins, the proposal calls for the roof of the building to be flattened. 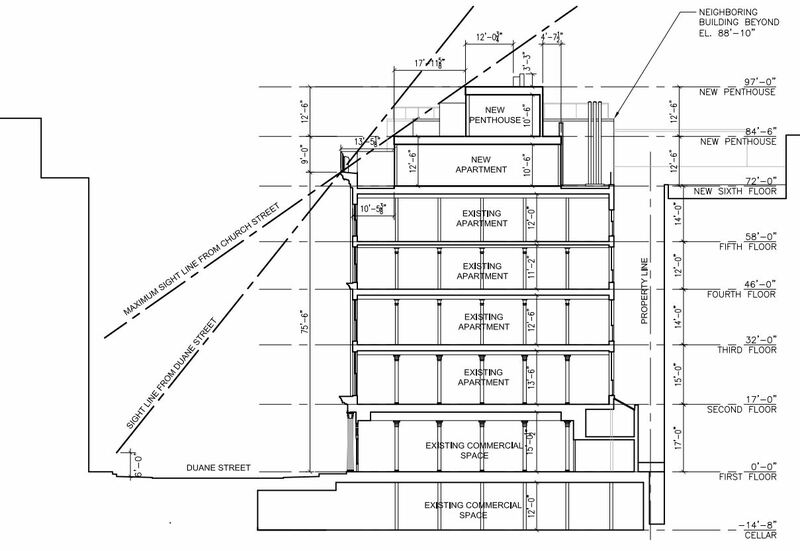 It is currently sloped inwards towards the back of the structure, with a water tower located on the northeast corner. With the proposed addition, the ceiling height of the fifth floor will be 12 1/2 feet tall. 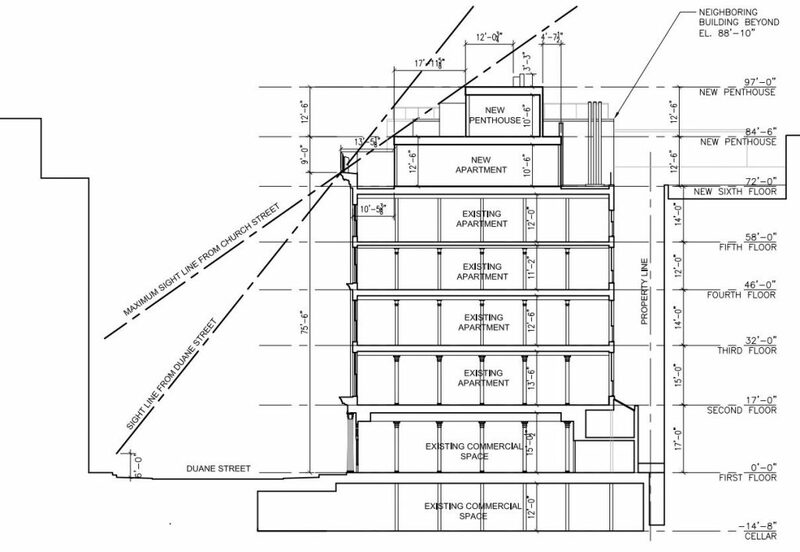 The new proposal will start about 10 1/2 feet back from the main facade, rise 12 1/2 feet, and step back about eighteen feet, to make way for the penthouse on the final floor. 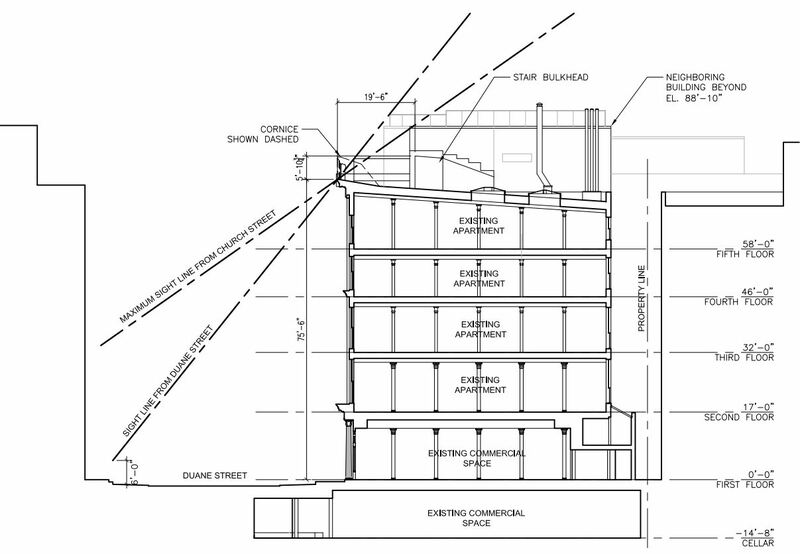 In total, the new addition will rise twenty-five feet from the existing roof line and bring the new height of 131-135 Duane Street to 97 feet. The water tower for the building will be repositioned slightly to the west, and will continue to sit in the back of the buildings roof. Several skylights are currently present, but will eventually be taken away when construction commences and finishes, while the staircases will be repositioned to respond to the new layout of the residential space going up to the seventh floor. The stair and elevator tower would use fiber cement panels while the exterior facade for the new addition encloses the interiors with sandblasted concrete. 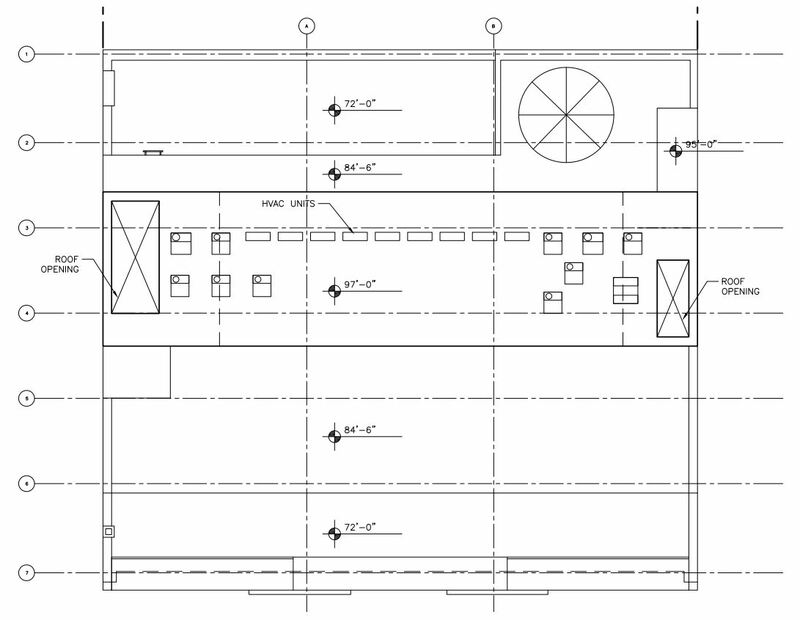 The new floor-to-ceiling windows are designed and supported with blackened steel frames. A rooftop terrace sits in the front and the back of the building, while the new sixth floor will feature 1 1/2 bedrooms, a kitchen with a pantry/laundry room, a dining and living room, a private elevator, and a staircase to the seventh floor, which will house the master bedroom and master bathroom, a private living room, and an additional expansive rooftop terrace. 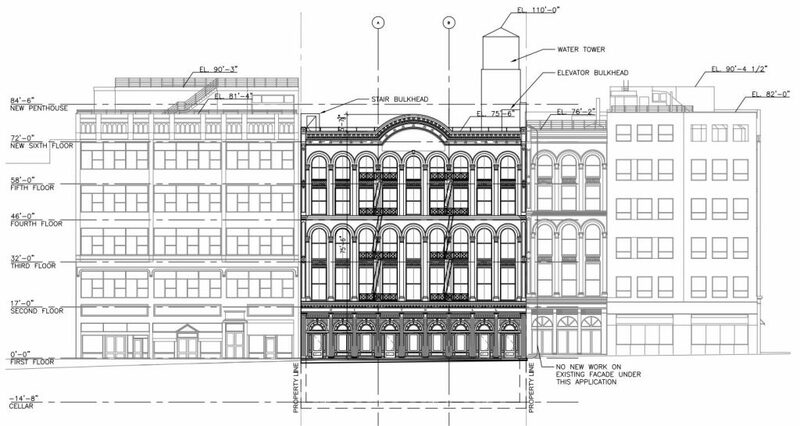 The project is among several residential additions that have already been added to conversions in the vicinity, along Duane, Reade and Church Streets. 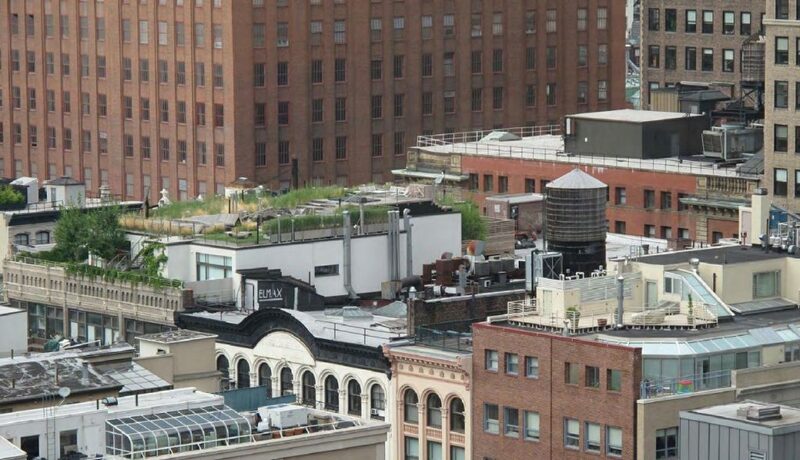 1 Comment on "Residential Addition Atop 131-135 Duane Street Heads to LPC in Tribeca"